I think the body of Christ would be much stronger if we stopped over emphasizing what is masculine and what is feminine. Men and women both have something to contribute and not because they are a man or a woman but because they are IN CHRIST. “There is neither Jew nor Gentile, neither slave nor free, nor is there male and female, for you are all one in Christ Jesus.” Galatians 3:28. I for one am sick of the oppression of women in Christiandom. I want to hear from the Lord and I don’t care if it is a man, woman, child, or what nationality they are. I empathize with people like a brother in his post how he was belittled because he didn’t measure up to the stereotype male. It is unfair, hateful and unedifying to say a “male looks and acts like this” and a “female looks and acts like this” in the kingdom. Just to be clear I am not condoning men deliberately trying to give the impression they are a woman or a woman deliberately trying to give the impression they are a man as in cross dressing, transgender type behavior but every man isn’t going to look like John Wayne and every woman isn’t going to look like Elizabeth Taylor. Brian ‘Head’ Welch, ex band member of Korn that recently committed his life to Christ, wears some make up but he is very clear he is a Christian and evangelizes very strongly. Phil Robertson of Duck Dynasty says you’re not a man if you don’t have a beard. The traditional garb of Scotland for men is the kilt which some cultures would call a dress. There are African and Native American people who wear makeup like war paint type markings. A man that gets a manicure or pedicure might be considered feminine by some. And personally I don’t think a man should wear skinny jeans. I gave all these examples to illustrate a point that there really is no set image of what is masculine or feminine that is standard for every culture. There are some churches who say a woman should not be allowed to teach or preach or lead. The body of Christ lacks and misses out greatly when women aren’t allowed to teach or preach or lead. Remember the account of Jesus and the woman at the well in John chapter 4? Jesus is talking to a Samaritan woman at Jacob’s Well, which the Jews generally rejected the Samaritans during that time, and reveals to her things he could not have known about her unless he was truly the Son of God or God revealed to him. He exposes her in a loving way to herself that she has had five failed marriages and is now living with another man out of wedlock. She isn’t offended. She is amazed. She accepts the truth of the gospel he shares with her. She is so excited that she tells everyone in town about it. So, in a sense, she is the first evangelist recorded in scriptures. Now, did Jesus say “Oh, wait a minute, you are a woman and you can’t preach”? Of course not. Jesus never addressed gender specific roles. He empowered women. He did not restrict them as some church denominations do. And what about this whole unscriptural concept of a woman must submit to a man. The family, nation and church suffer when it is only the woman that must submit to a man just because she is a woman. The scriptures regarding submission is for everyone, not just women. Think about it. What if the man is a jerk, does a woman still submit to him? That is what some churches teach. We submit to one another’s gifts. We support those who God has gifted in a certain area whether they are male or female. We are to be givers and not takers submitting to one another and supporting one another. As a Cherokee and from personal experience in gatherings of modern day tribal events I have personally witnessed children and teens teaching adults, I have seen young people sitting at the feet of the old to learn and I have seen old people sit at the feet of the young and learn. 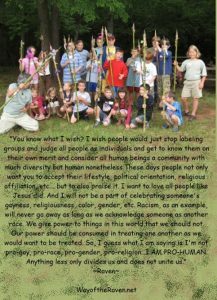 I used to hold an annual primitive skills gathering I called TRIBE Gathering, meaning the tribe of all humankind. And I must say I have yet to see a single church I have been to that matches one of those gatherings as far as mutual respect of the young, old, male, female, race, creed, etc. I have been a Christian since 1975 and many that know me personally can testify to my solid commitment to Christ and my belief in the integrity of the scriptures. Honestly I think most people who call themselves Christians just need to get over themselves and their comfortable empowering labels and let God be God in our churches. I really struggle with how church bodies seem to jockey for positions of power and authority and create unscriptural parameters for people to operate in when it is only a delusion to keep a certain part of the church population down. Most men I know are threatened by a strong woman. When in reality a strong partnership between a man and a woman is a formidable force for the kingdom and otherwise and it isn’t all men’s fault either. Women historically have placed themselves in a weak role and then resent it when men play the game they THINK they want to play. As far as male leadership goes, if the man and the woman were in a right and scriptural relationship with God I think generally women would rise to the support of male leadership but when it is forced, coerced and took out of scriptural context they both struggle at the expense of the gospel being spread efficiently. If the church is ever going to be strong and world changing as God intended it to be and if our nations and communities are ever going to be strong and world changing as God intended it to be we have got to get over ourselves and this concept of one person or group being superior than another person or group. We all have something to contribute to a better world and we should honor and respect all created beings no matter what gender, race, age or creed. The warrior is a man of principle. He doesn’t set his principles aside when they seem inconvenient. Today many people do just that. They use the actions of others to justify their own bad behavior. 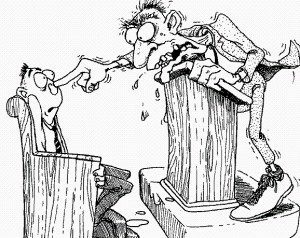 Statements such as, “Well I wouldn’t have done that if he hadn’t shoved me, cursed me, been rude to me, etc.” are commonly heard to justify bad behavior. The warrior should not allow the behavior of others to affect his own behavior, at least not as far as doing things that are against his principles. 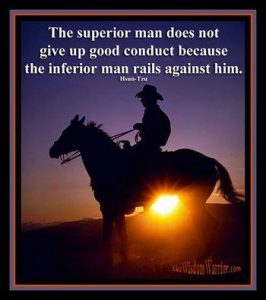 Of course, as a warrior, there may be times when the actions of others may cause you to have to take action, but this is different than allowing someone else’s actions to affect how you respond as far as your principles are concerned. The warrior must respond, not react. Even if you have to take physical action in a specific situation, you can still do so without lowering your principles. The true man of principle can’t set his principles aside. They are a part of him, a part of his spirit and who he truly is as a human being. 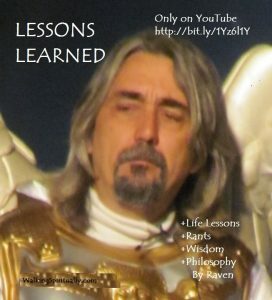 The Warrior Ethos is NOW AVAILABLE on Amazon at:http://tinyurl.com/TheWarriorEthos or on my website at:http://thewisdomwarrior.com/ Get Your Copy TODAY!! “What is real? How do you define real? If you’re talking about what you can feel, what you can smell, what you can taste and see, then real is simply electrical signals interpreted by your brain.